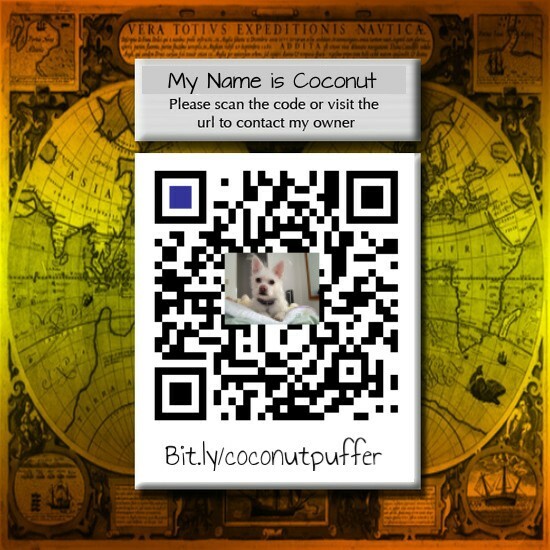 Now You Never Need To Worry About Losing Coco-nut "Puffer"
Scan this code with your smart phone or simply open up your phone's web browser and go to Bit.ly/coconutpuffer. Click HERE to see a simulation of what Coco-nut's page looks like on a mobile phone! 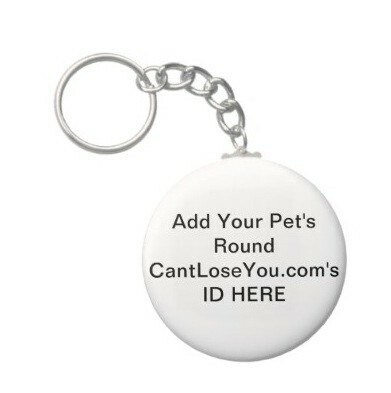 It is very easy to use the CantLoseYou.com Pet ID System. Most people like to download these pictures onto their home computer and then go to websites like Zazzle.com where they can customize cool stuff like doggie shirts, customizable dog and cat tags or just about anything that can be printed. You can just upload these pictures right onto any item you want! We created a square ID for you (for pet tags with a square area) and the round tag below (for pet tags with round customizable areas. 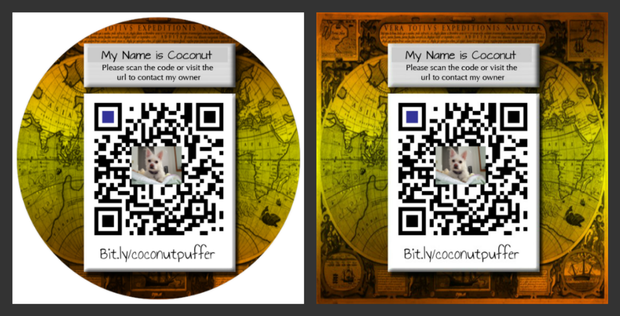 There's no need to purchase a new pet tag if you already have a pet tag where you can insert one of these QR codes. 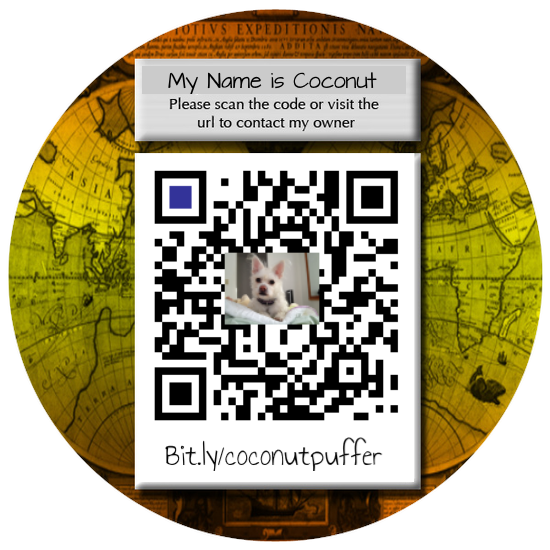 Simply print the QR codes below and insert into your pet tag. When you print just make sure to adjust the size so it fits into your pet's tag. As a note, you can also make stickers on Zazzle.com. The fun thing about the Never Lost pet tracking system is that you can add them onto any printable object. Add the custom codes we made for you to t-shirts, keychains, pet tags and make sure that if your best friend ever gets lost that you will be able to find them again quickly. 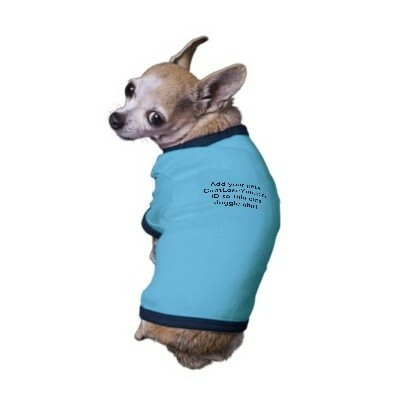 Add your pet's CantLoseYou.com ID to this cute doggie shirt. Add your pet's round CantLoseYou.com ID to this tag. Add your pet's round or square CantLoseYou.com ID to this tag. Thanks for purchasing the CantLoseYou.com Advanced Pet Tracking System. We hope you have fun with this. If you love our product let us know. If you have suggestions we'd love to hear them as well.